hd00:31Two brother of a tourist walking with backpacks, holding hands. Happy children are walking in nature on a sunset background. hd00:17Family on bicycles in nature. A woman with a child on a bicycle. hd00:18Family on bicycles in nature. Mom and daughter on bicycles on a field of sunflowers. Mother and daughter in hats are walking through sunflowers field. The concept of the family. 4k00:30Elderly grandmother teaching happy cute toddler grandsone to ride a bike on countryside road in summer on green fields. Sweet little boy learning to ride a bicycle. Side view. Steadicam shot. 4k00:31Handsome blonde toddler boy riding bicycle as grandmother giving him a helping hand in summer countryside during sunset. Excited grandson learning to cycle on bike. Steadicam shot. 4k00:18Closeup cute smiling and happy little toddler boy learning to ride a bicycle with helping hand of grandmother assisting him. 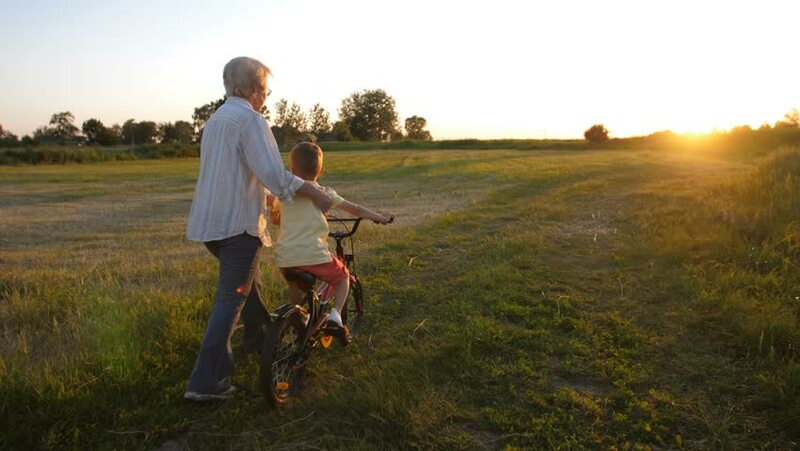 Granny teaching her grandson to cycle in nature during beautiful sunset.